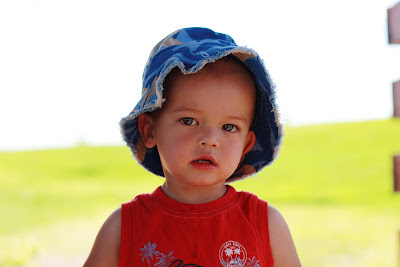 Josh and Alex have been spending some time fishing at the park down the street. They have a stocked pond so that kids can catch & release. Inevitably she gets bored with it and wanders off to throw rocks or play in the dirt. 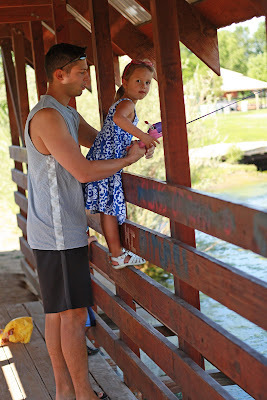 But she still wants to see the fish, so she makes daddy keep at it. 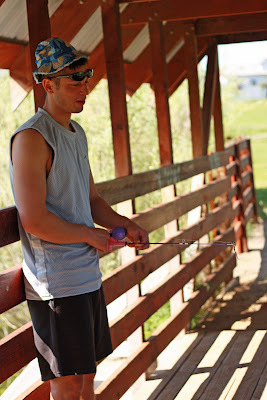 Something about my man fishing all alone with a baby hat and a princess pole that makes me smile. It's cute. 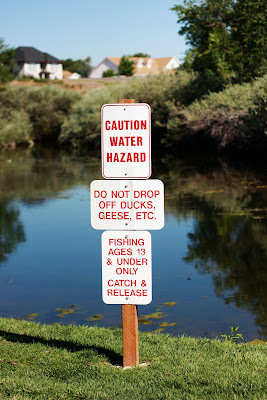 See the bottom sign, but only after you make a mental note not to drop off any ducks or geese at Legacy park. Or etcetera, definitely don't drop that off. 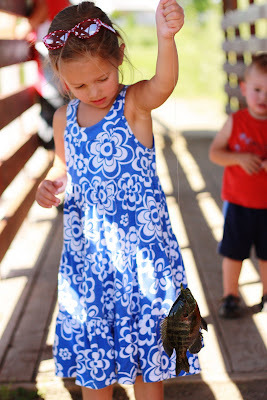 While daddy's busy taking the hooks out of the fish, Alex tries to feed them bread. I tried to explain that it's the equivalent of someone holding her head underwater and offering her ice cream at the same time, but she didn't quite grasp it. She's all for ice cream under any circumstance. In other news, we have a long weekend! Josh took Monday off and we have some plans. We have business to take care of. Business so important that we will be leaving the kids in the drop-in care center all day. Remember that wedding the kids were in? Well the bride and groom gave them a very thoughtful gift-- a gift card to this place. And we've determined that since they aren't old enough to fully appreciate the fun there is to be had there, we'll go ahead and experience it for them. Alone. I feel just the slightest bit guilty. I think I'll throw in a few extra treats in their lunch bags; that ought to assuage the guilt. Yup, guilt gone! Here we come water slides!! 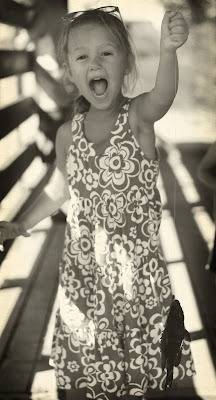 TOO MUCH FUN!! Josh, don't lift your hands up when the teenager tells you too. And, I think Keith did the majority of fishing there too. I say take 'em to the playground when it's raining. Or put one of those fisher price slides in the bathtub. Easy free water park! When you say "no one needs stitches this time"....?